It was great to participate in another Fun Sailing race. This year the weather was picture perfect. Thanks to our starting boat M/V AlleMare ( Allen and Mary ) who did a great job " tooting their own horn". They also got some great action shots. Skipper Carl Bunnin, and Crew on Toon-Town were feeling pretty chill as we crossed the start. Cockpit crew Bob McKinnon, Bryan Westby, and Al Cannon took turns at the helm and tacked us nicely around the course. 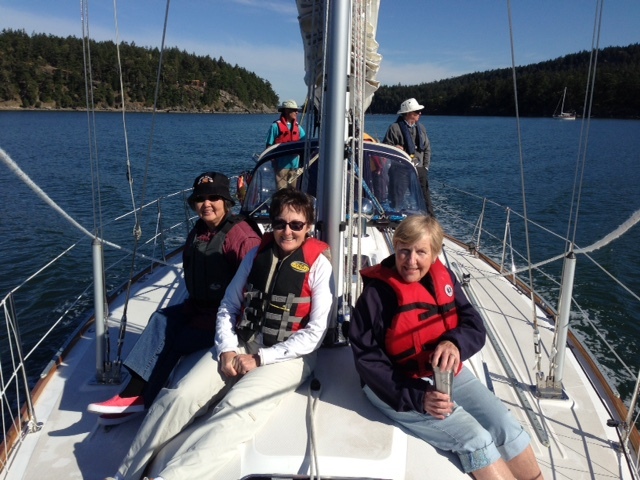 The good looking deck crew ( Elspeth Westby, Mary McKinnon, Gail Mitchell, Sharon Bunnin) enjoyed soaking up some natural Vitamin D, while making sure the guys stayed on task and navigated properly. Elspeth got some great pictures from the deck. How did we get a total of 30 boaters onto 5 sailboats? It was just as interesting getting them into the restaurant ! The staff at Browning took good care of us and we all enjoyed ourselves.